High Density Bamboo Mat Board to give your kitchen the rustic and unique look you always wanted. What’s more is that they are sturdy and durable, ensuring you get an excellent value for money for your product. The visually appealing collection of Printed Placemats manufactured by us is in great demand for delicate design, unique patterns and price affordability. 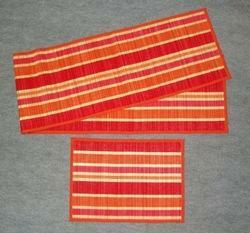 These printed placemats in cotton, manmade materials and straw and bamboo make ideal gift items. Straw- bamboo table mats available with us are made using real bamboo sticks weaved together along with high quality fabric. These table mats are available in beautiful colors, designs, sizes and shapes. Being made of bamboo and straw, these last long and prove to be heat resistant. 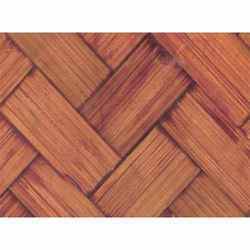 Clients can avail our range of straw- bamboo table mats at market leading prices. We offer Bamboo Dining Table Mat to our clients. Bamboo Dinner Mat, Size/Dimension: 12"x8"
Each packet is a 13 piece set containing 1 5ft long table runner, 6 placemat sets and 6 coaster mats. The tablemats are woven with great care and finished with a cloth lining. They are ideal for bulk gifting and to propogate ecofriendliness. They are available in single colour, double colour weaving and diamond weaving. Colours and size can be customised to your requirement. These bamboo table mats are elegant and add appeal to the table, on which these are placed. Beautifully crafted, our range is available in varied sizes and shades. The beautiful bamboo table mats are available in a wide varieties of designs and styles for the buyers to choose from. Our range can also be custom-designed in accordance with the demands of our clients. Bamboo Table Mats make table mats extremely appealing and attractive. They are available in different shapes as sizes as per the requirement of the client and area of application. We are one of the renowned wholesaler, exporter and supplier of a high quality range of cane baskets and cane decorative handicrafts with brass and wrought iron, bamboo handicrafts and cane furniture. Good quality Bamboo Table Mat. 6pcs, easy to maintain .washable and long lasting.